Standing against moulding wallpaper in a small, dank bedroom, a woman known only as Mrs M, looks grimly at the camera as she clutches one of her four young children close to her chest. Her three others, two boys and a girl, huddle beneath two grubby rain coats - their blanket for the night - as they fight for space on two sodden cushions so they are not forced to sleep on the rickety bed's exposed metal springs. The house that they share with Mrs M has no bathroom, no hot water and the walls are running with damp. Outside, there is a thick layer of snow and blasts of the freezing winter air sweep through a hole in the broken window. 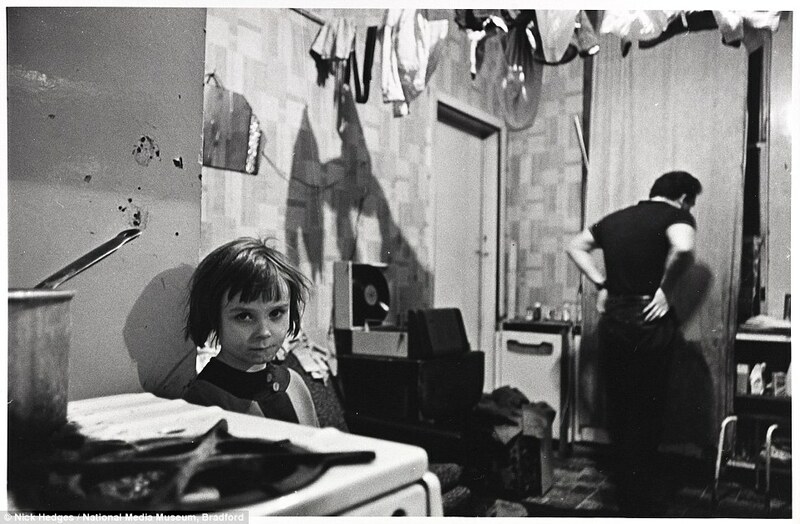 This harrowing scene of a young British family living in abject poverty is just one of the shocking images included in a new photography collection that captures the real squalor of what it was like to live in the nation's slums - just 40 years ago. 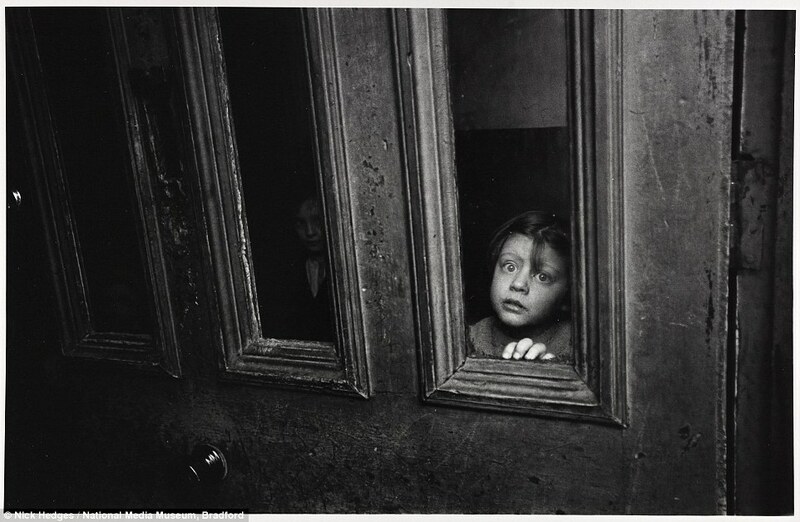 Photographer Nick Hedges spent three years visiting areas of deprivation throughout the UK in the 1960s and 1970s to create these stirring images for the housing charity Shelter. 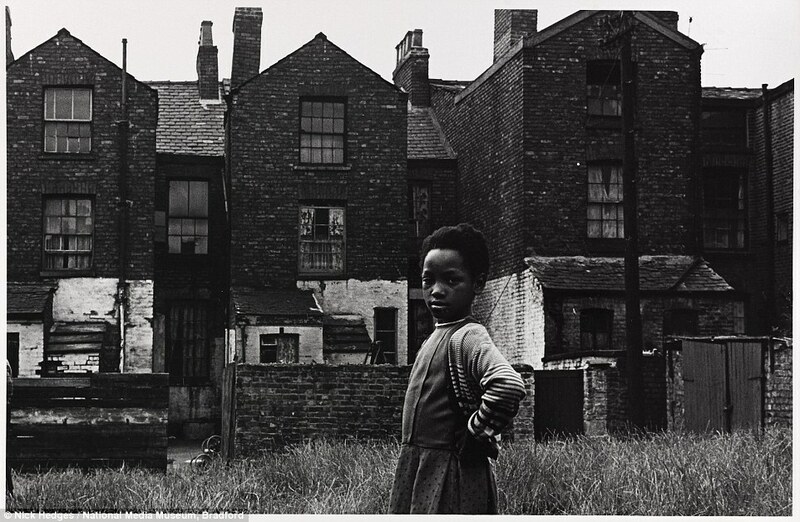 Launched in December 1966, the charity's campaign aimed to dispel the myth that only living on the streets were homeless and to change the way people think about social issues, using the power of photography. 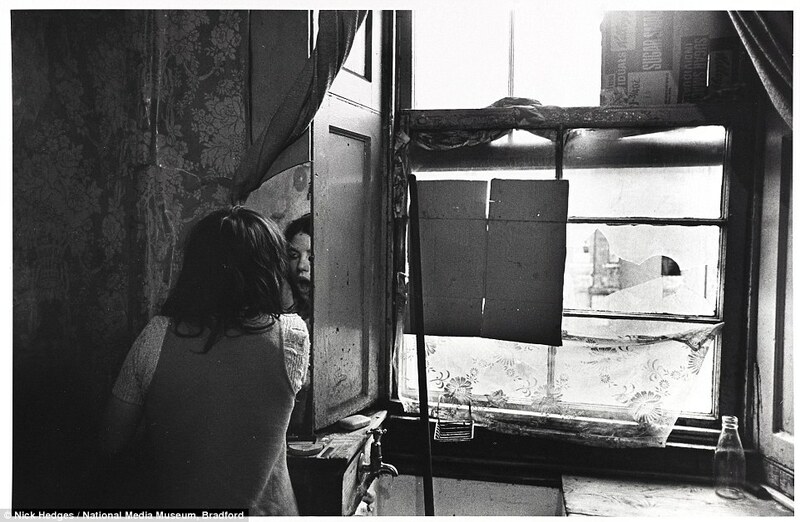 Mr Hedges photographed slum housing in major cities such as Glasgow, Birmingham, Manchester, Leeds, Bradford and London, documenting the daily struggle of the nation's poorest and the distressing conditions faced by more than three million people. 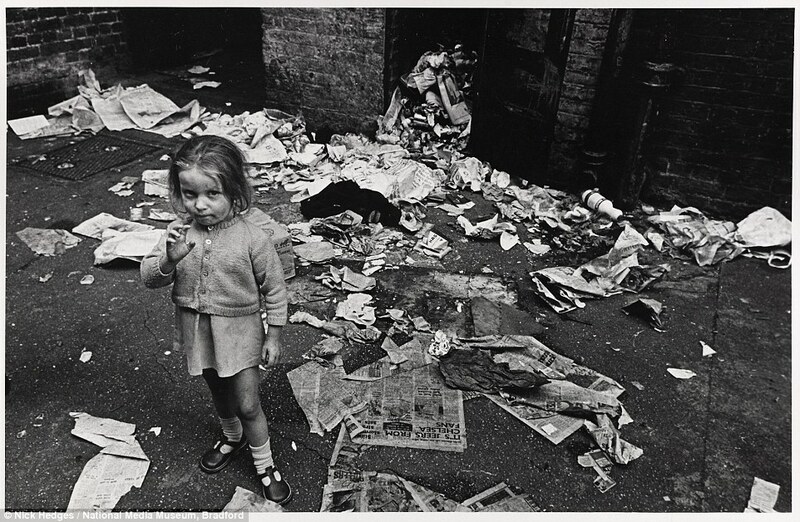 At the time it was highly unusual for a documentary photographer to focus on domestic issues, as war and international stories were more favoured in the media world. 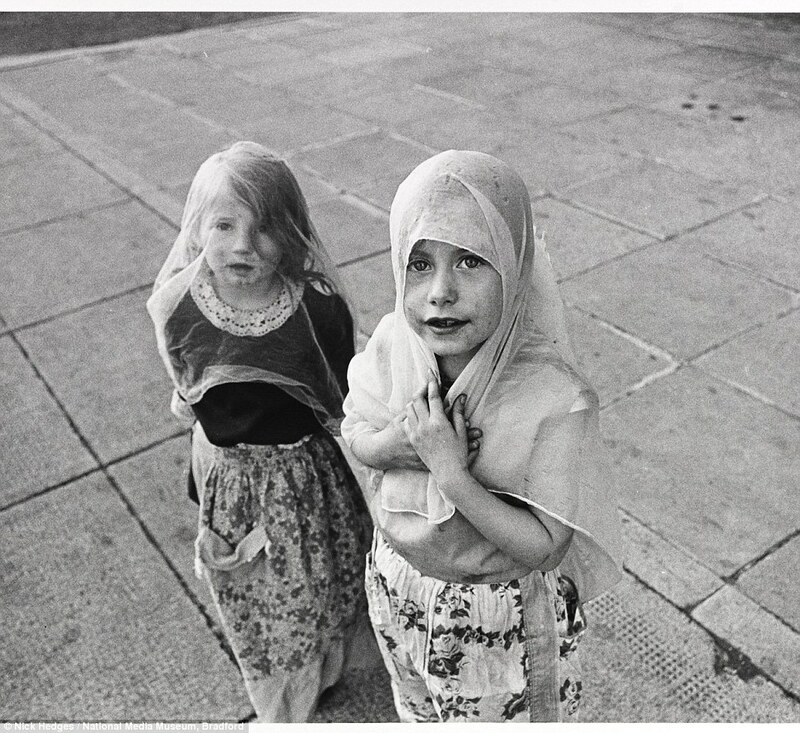 Despite being taken decades ago, the photographs have not been shown publicly since then following a 40-year restriction to protect the anonymity of the subjects. He donated 1,000 prints from his work to the National Media Museum in 1983 but they could not be used for that reason. During the project, Mr Hedges came across families who slept with the lights blazing to keep the rats from scurrying around their house at night; bedrooms filled with pools of rainwater and kitchen walls decorated with reams of peeling wallpaper. 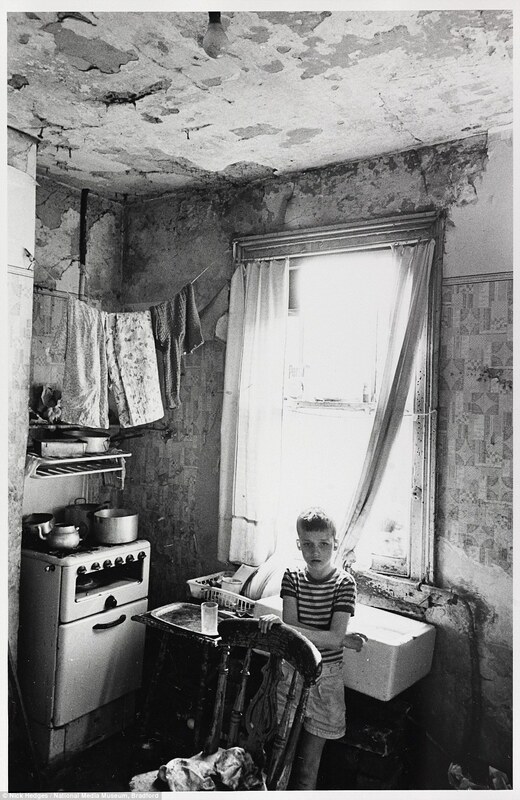 In one photograph taken by Mr Hedges, a father looks desperately at the kitchen wall in his rat-infested Glasgow home as his young son looks innocently into the camera. 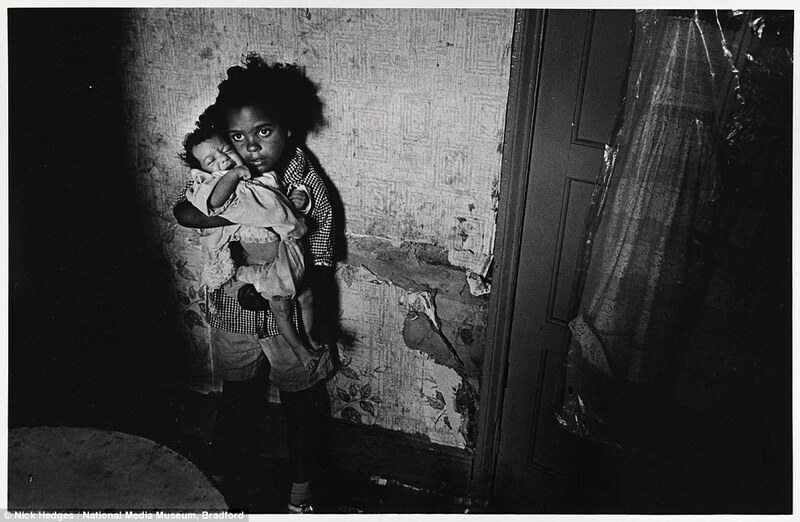 In another, a young girl dressed in rags cuddles a screaming baby close to her as she stands in a lonely, dark house. 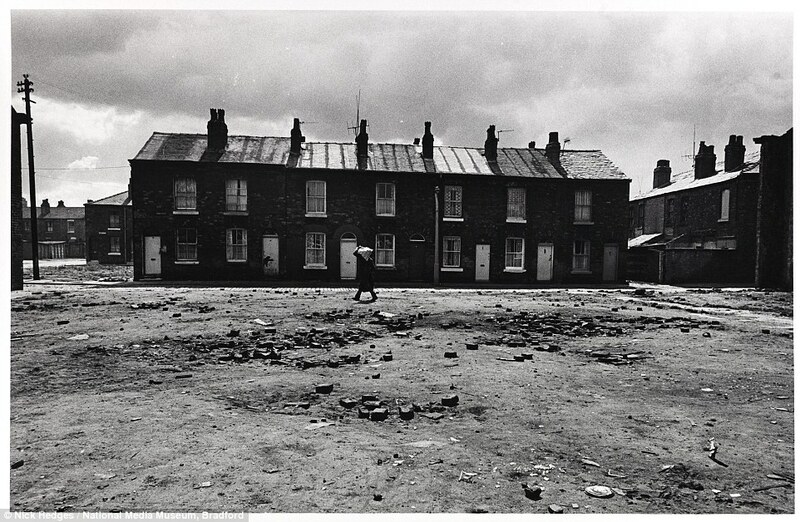 Desolate: Terraced houses stand in a deferred demolition area in Salford, Manchester, in June 1971. The photographs, including the one above, have not been shown publicly since then following a 40 year restriction to protect the anonymity of the subjects. 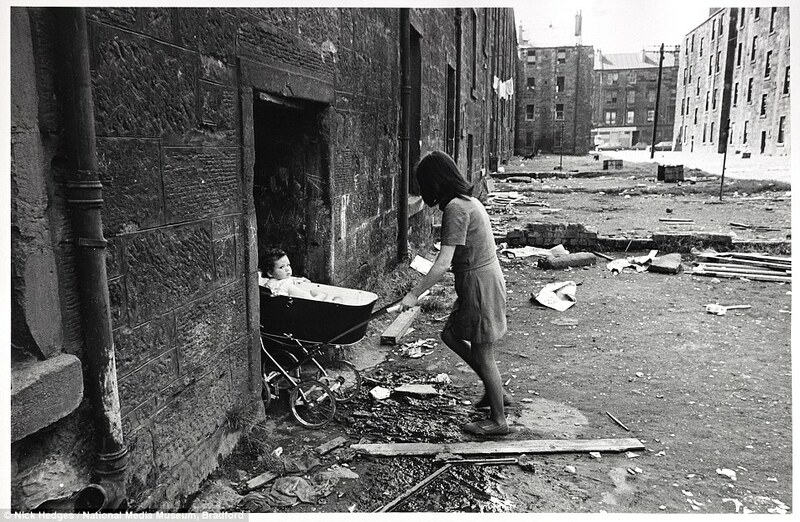 Mr Hedges came across one family living in Glasgow - Mrs Gallagher and her children - who kept their lights on at night, to keep an army of rats away from their home at night. They once counted 16 rats in their room. He met one woman - Mrs Chichockjy - in Liverpool in July 1971, who had been visited at their home by then Housing Minister, Peter Walker. 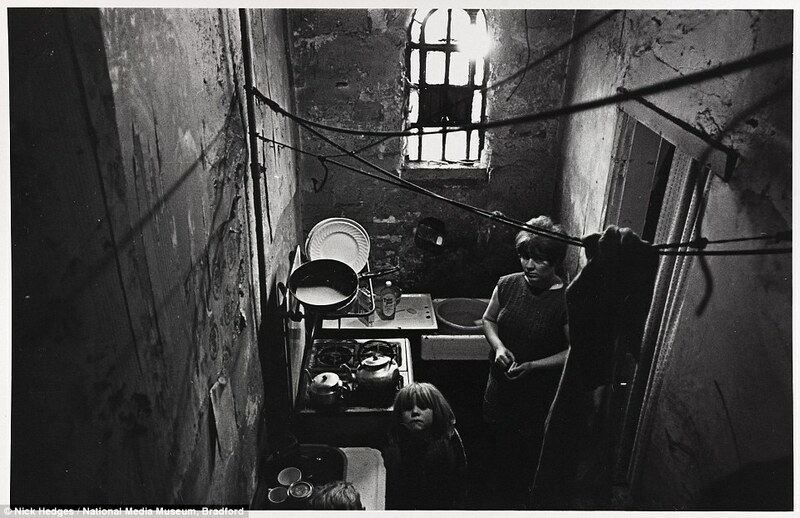 She told the photographer that Mr Walker had said it 'wasn't fit for human habitation' - before adding 'and I'm still here'. 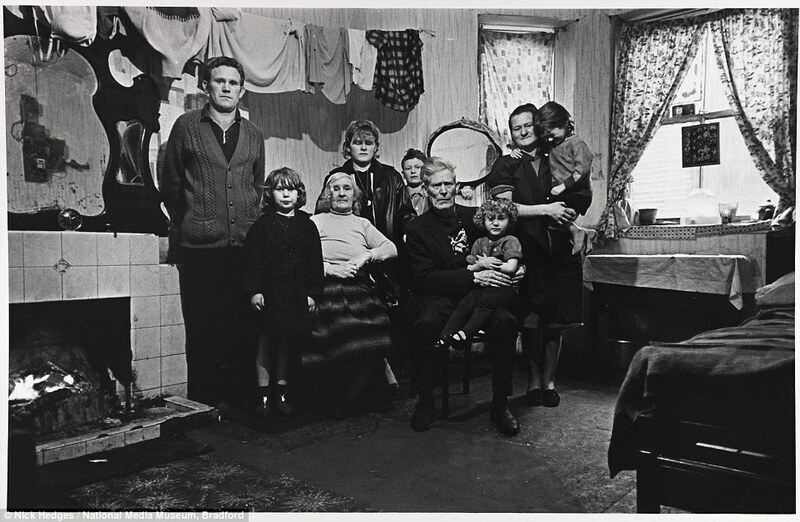 Meanwhile, Mr Hedges photographed one property where three generations of an Irish family - consisting of nine people - lived squashed in a single basement room in a multi-let house in Toxteth, Liverpool. With each moving image, Mr Hedges included detailed contemporary notes, extracts of which will appear alongside the collection of 100 photographs when the exhibition - entitled Make Life Worth Living - opens at the Science Museum, London, on Thursday. 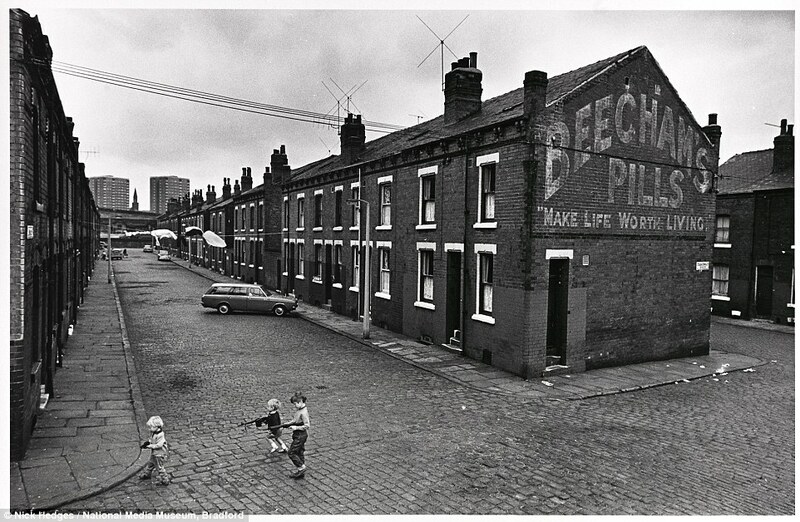 Mr Hedges said: 'Although these photographs have become historical documents, they serve to remind us that secure and adequate housing is the basis of a civilised urban society. 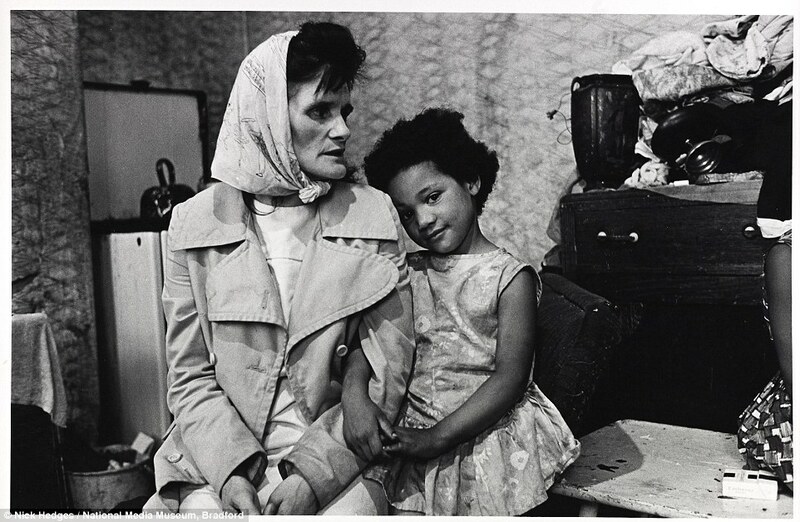 Campbell Robb, Shelter's chief executive, said: 'Nick's pictures were crucial to the early days of Shelter's campaigning, capturing a stark reality that many people in Britain couldn't even imagine, let alone believe was happening in their community. 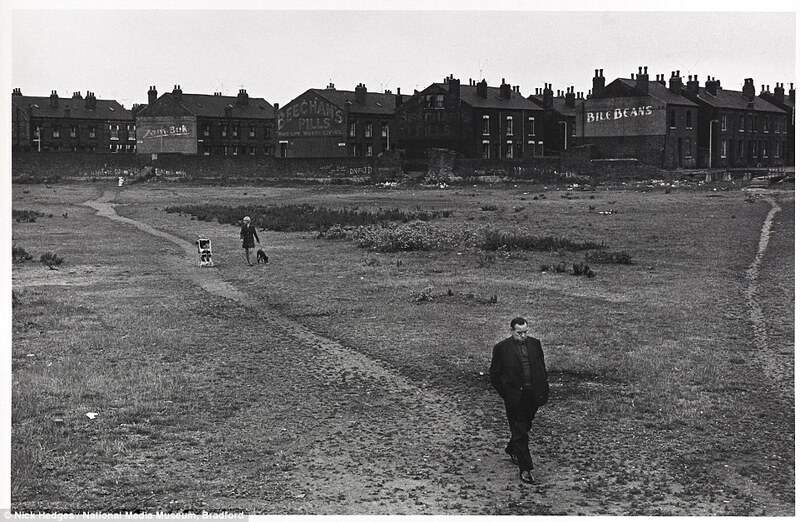 'Many of the scenes that Nick captured are from places that have long since been regenerated, but conditions not a million miles from these exist in our communities even now, with poor housing, sky-high house prices, rogue landlords and a housing safety net that's being cut to shreds leading three million people to turn to Shelter each year. The exhibition, co-curated by the independent Dutch curator Hedy van Erp and the National Media Museum's Curator of Photographs Greg Hobson, starts today and continues until 18 January, 2015 at the Media Space, Science Museum, Exhibition Rd, London SW7 2DD. Entrance is free. The main measure used by the Government to define poverty in the UK today is whether or not the household income is below 60 per cent of the median income. This is calculated Before Housing Costs (BHC) such as council tax and rent are taken into consideration. The UK's average salary, as of January 2014, is £26,500. The latest figures on poverty from 2012/2013, released by the Department for Work and Pensions in July this year, shows the average household income Before Housing Costs is £440 per week. Based on that figure, the report found 15 per cent (9.7m) of Britons are living in poverty. 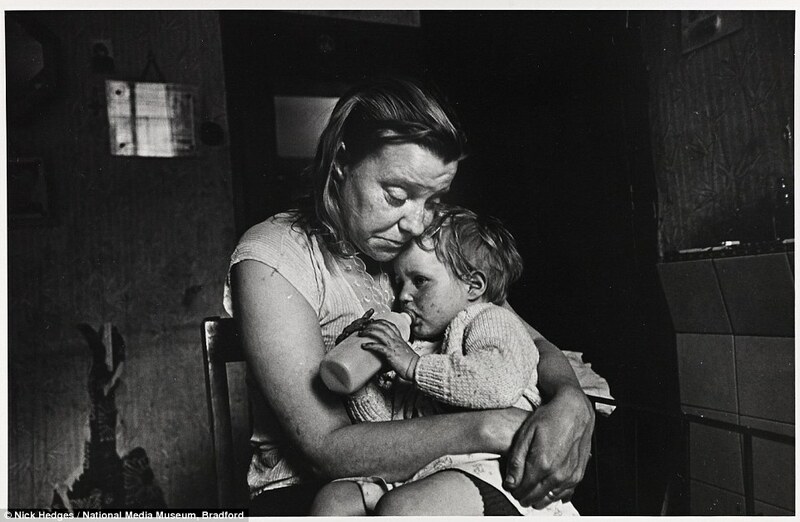 There have also been other types of poverty introduced which are recognised by the Government. These include fuel poverty and material deprivation, the latter of which refers to the 'self-reported inability of individuals or households to afford particular goods and activities that are typical in society at a given point in time'. The Government also recognises 'persistent poverty', seen as those living in households where income is less than 60 per cent of median household, for at least three out of the last four years. In 2011, each person's disposable income in the UK was around £14,000. The 60 per cent measure is criticised because it is relative to the current economic state of the country - meaning there could effectively be 'less people' living in poverty during a recession. In the 1970s, the then Ministry of Social Security simply adopted the basic scale rates paid by the National Assistance Board, plus rent, as the poverty line. Those who had income of less than that were deemed to be living in poverty. 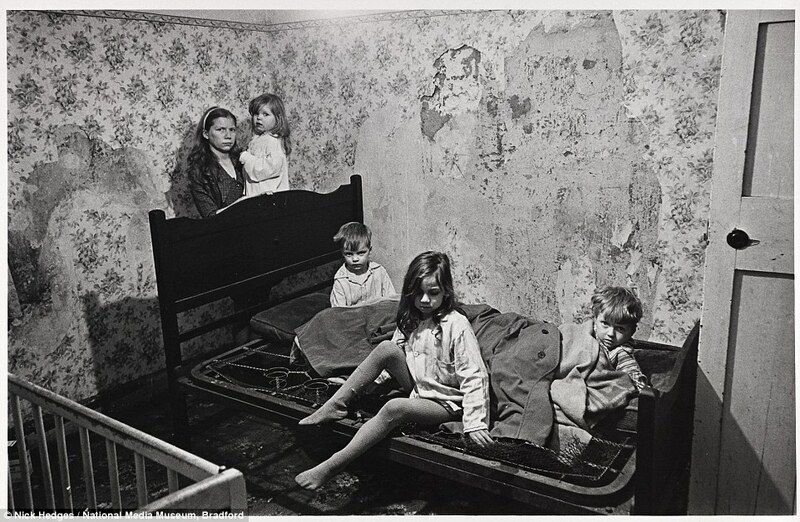 In 1961, it was estimated that the average income for households was £960 per year. In 1971, it was around £2,000. It crept up slowly, accelerating in the mid-70s until, by 1979, it was about £5,000. 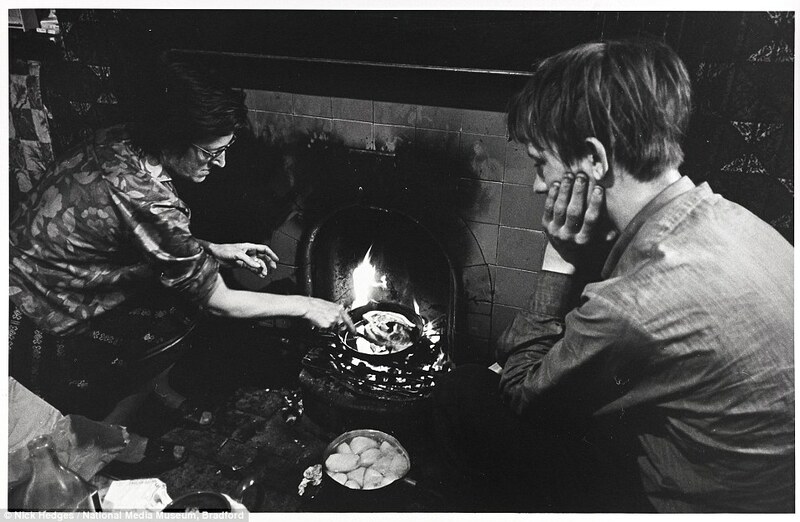 In a pioneering study on poverty in 1965 - around the time these photos were taken - Professors Peter Townsend and Brian Abel-Smith measured poverty based on the number of people living below the National Assistance levels of living, given to people by the Government. Using this poverty line, Townsend and Abel-Smith estimated that some 14 per cent (around 7.5 million) of Britons lived in poverty. 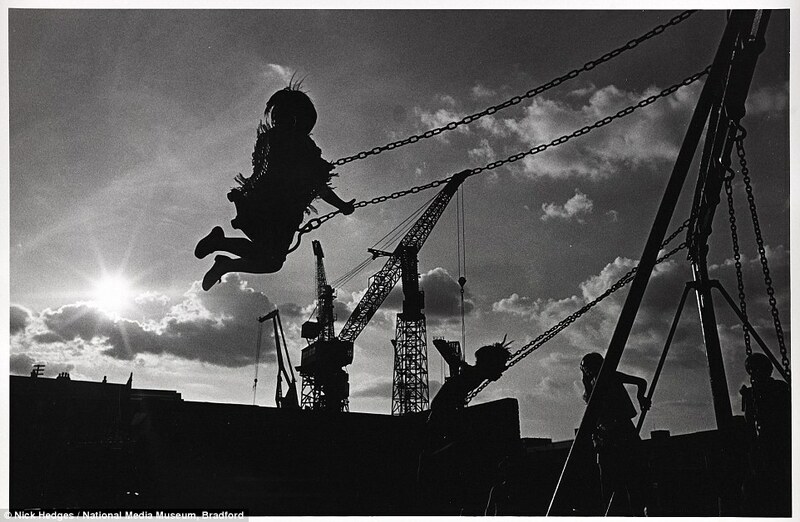 In 1960, each person's disposable income per head was £4,754. 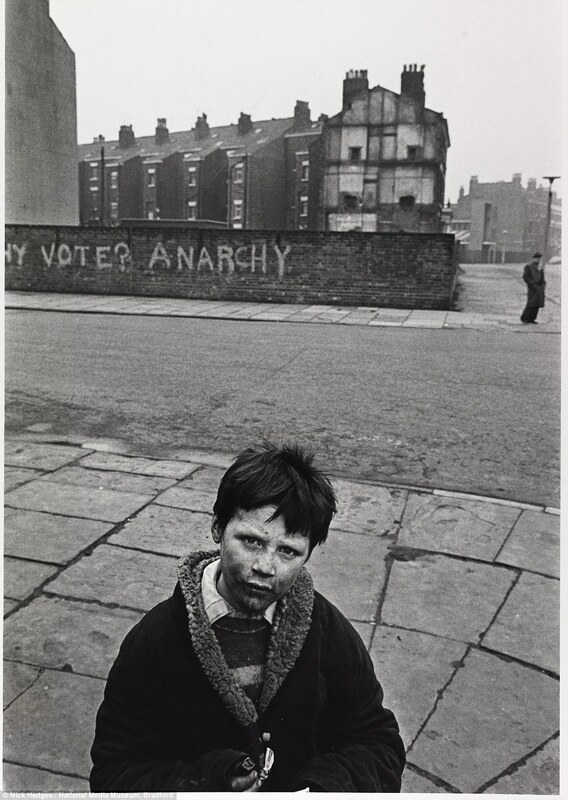 In 1970, it was £5,752. According to the 60 per cent rule, relative poverty fell during the recession of the mid-1970s, because median income fell - even though real incomes among the poor fell on average.